The third Startup Europe Week 2018 (5-9 March) has finished with a bang, exceeding even the explosive success of last year. For the first time, #SEW18 has gone truly global, with events taking place in 50+ countries across Europe, Africa, the Middle East and Asia, growing an ever more digitally connected global entrepreneurship community. Startup Europe Week (SEW) is the largest multi-event of its kind for startups in Europe, which aims to show entrepreneurs the support available at a local and regional level. The initiative is run by a small independent international team, and is given visibility by the European Commission’s Startup Europe. This year, representing the true spirit of regional connection, #SEW18 was launched on Monday 5 March with a joint kick-off, beginning in the morning with Brasov (Romania) and continuing in Vitoria (Spain) during the afternoon. 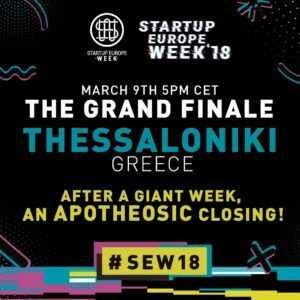 Shining the spotlight on another startup city, SEW closed with an apotheotic grand finale in Thessaloniki, Greece. For the first time ever, SEW has truly gone global – reaching outside the realms of Europe into Africa, the Middle East and Latin America. In Sao Paolo, Brazil, local players such as a co-working space and a law firm came together to help entrepreneurs joining the startup environment in Brazil; in Lagos, Nigeria, founders, CEOs and COOs of startups joined forces for panel discussions on how to set up business within the local ecosystem. This global expansion is one which SEW intends to nurture for #SEW19, opening SEW up to be a worldwide, inclusive movement. This year, SEW saw an increase in worldwide digital connections: live broadcasts exploded onto social media (e.g. Facebook Lives, Snapchat, Twitter), local events connected to each other via video call and speakers channelled in digitally from other parts of the world. The #SEW18 team were also able to communicate operations with the hundreds of co-organisers via Facebook Live chats, including live Q&As. To add to this, the collective digital footprint of the #SEW18 community this year was beyond impressive, achieving +18 million impressions and reaching an audience of +6 million people, in just over two weeks! These digital connections are helping to grow SEW into a locally focused, and internationally connected, entrepreneurial community! A HUGE congratulations to all of the SEW18 co-organisers for rocking this year’s events. You have helped local entrepreneurs find the resources and support they need locally, in order to grow globally. You guys are amazing! We would also like to send a special shoutout to F6S for all their hard work setting up and managing the events on their platform – you guys rock! – and to Hugin and Munin for all the amazing graphics and poster designs for all the co-organisers! Stay tuned for the official SEW18 Facebook album (click here to see last year’s SEW17 album) and please feel free to contact us if you would like to partner for SEW in 2019 – we are always looking for new connections!